Hot weather is great; whether you’re out on a day trip, going on holiday or just enjoying the bright sun through your window at work. What’s not great is getting back in your car at the end of the day and having to brace yourself against the massive wall of hot, stale air that’s built up while you’ve been away. Make sure that your drive is comfortable as soon as you set off - this solar powered car fan makes sure that air keeps circulating while your car is parked so that you come back to a cool, fresh interior. It works by blowing hot air out and drawing in fresh air, stopping things from building up all day. This also airs out any bad odours – if you’re a smoker or a dog owner you may have noticed a wrinkled nose or two when you give people lifts. By getting rid of the smelly air and replacing it with fresh air from outside, your guests won’t notice a thing! The fan works via solar power, so there’s no need to keep replacing batteries and you can feel great about protecting the environment. It will fit onto any car window, simply slotting in to the top in a way that is compact and secure. 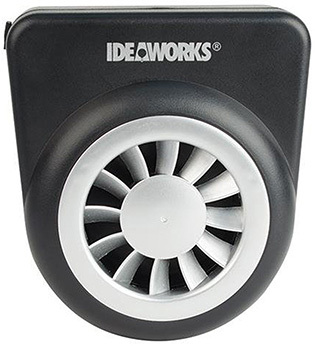 For perfect freshness in all weathers, the Ideaworks Solar Auto Fan offers unbeatable ventilation.